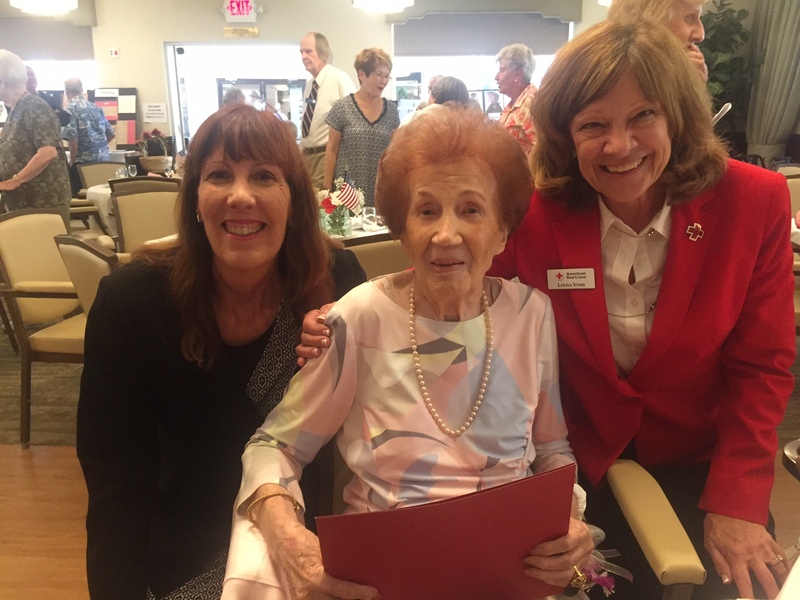 The American Red Cross recognized an Orange County resident marking her 100th birthday, June 23rd at the Freedom Village Retirement Home. Ruth “Riki” Belew of Lake Forest, is a former Red Cross volunteer who served in Africa and Italy during World War II. Belew’s 100 year celebration coincides with the centennial of the American Red Cross Desert to Sea Region, which includes Orange, Riverside, and San Bernardino Counties. The journey that led Belew to the Red Cross began when her brothers inspired her through their service in the U.S. armed forces. From crossing the Mediterranean in the nose of a B-17 bomber during a “terrific” storm, to serving U.S. troops stationed in Africa and Italy, Belew lived her own story to tell from World War II. Some of Ms. Belew’s more memorable experiences with Red Cross involve entertaining the King and Queen of Greece, breaking bread with the Bedouin in their Moroccan tents, and dancing with the troops in Italy. “I remain grateful that I had the opportunity to serve with the Red Cross,” said Belew. Ms. Belew’s contributions to humanity did not end with her work in Red Cross. She earned national recognition for educating children in downtown Detroit for nearly forty years.